It happened the other night: a midnight urge to nip to the toilet. Instead of turning the lights on, I thought it best to leave them off so as not to wake anyone in the house up. Turns out this was a big mistake. I tiptoed out of my room and attempted to make a dash for the bathroom. Only I didn’t see the door and I hit my toe on the corner. Trying to keep quiet (which was no easy feat, trust me) I continued… Only to walk into the sink. Scrambling around with my arms flailing, I tried to find the toilet and ended up knocking a lotion bottle off the shelf. I ended up having to turn on the light, after all. But what caused all this banging around (except my inability to see in the dark)? My itsy, bitsy, teenie, weenie bathroom. Most of us in Britain have to put up with small bathrooms. In fact, houses in Britain have been found to be as much as 80% smaller than some of those in European homes. The age of ‘rabbit-hutch Britain’ is well and truly upon us. Whilst we can’t change the size of our bathrooms (not unless you’ve got a hefty wad of cash), we can ensure that we get the most out of our bathroom space and learn to love our tiny bathrooms. If money (and time) allows, then it may be worth considering a remodelling job. Instead of a huge bathroom vanity, swap it for a delicate pedestal or even wall mounted sink to free up valuable floor space. Consider swapping your bath for a shower or even downsize to a cloakroom suite. 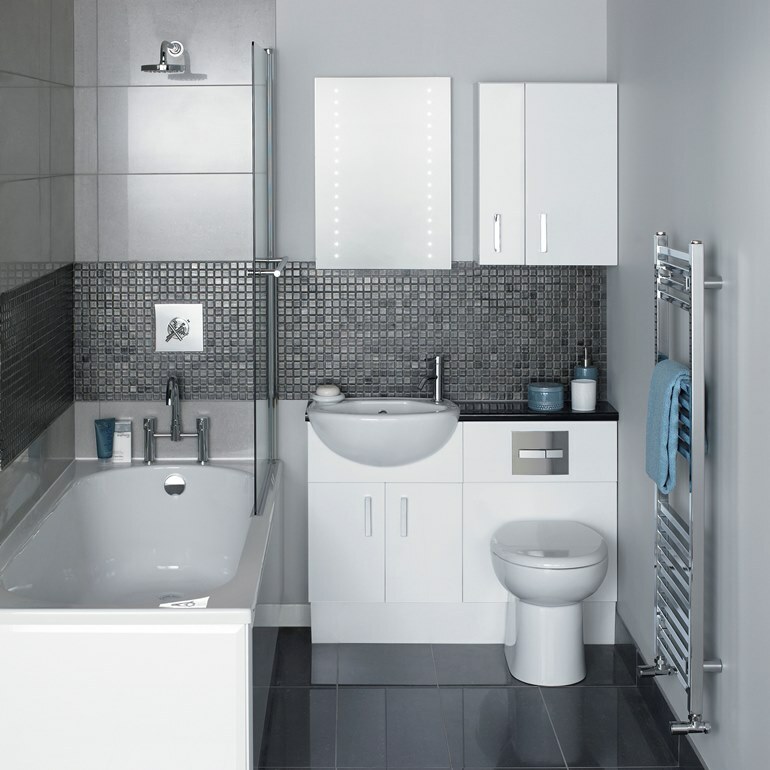 Smaller toilets, sinks and baths all ensure you’ll have a little more room to play around with. 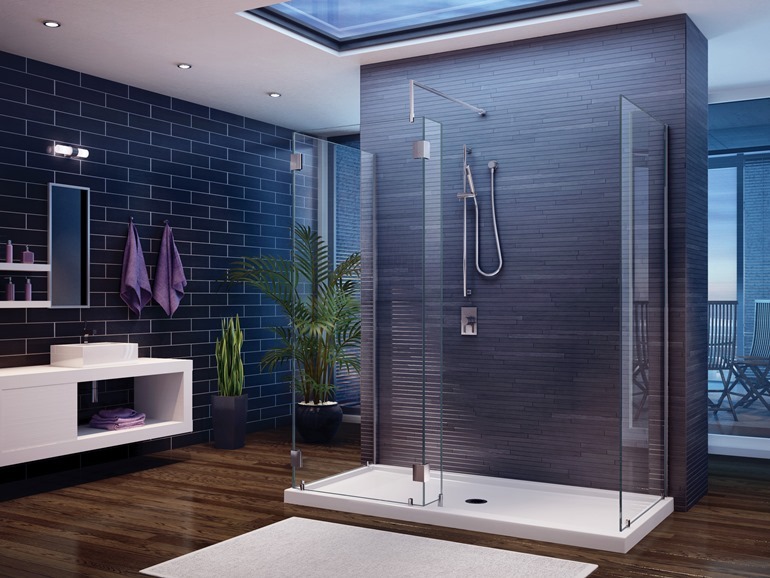 Because of the transparency of glass, it almost looks invisible so glass shelves or a glass shower door will give the feeling of space. Glass allows the eye to travel the entire length of the room. For extra bonus points, choose a sliding or bi-fold screen so it doesn’t encroach on space when opened. The key to opening up any room is to ensure it is light and airy. Paint the bathroom in a colour that reflects light – any light, cool colour will work. You’ll need to keep it simple for small bathrooms. Paint your walls to match your tiles and be careful with monochromatic shades as they can make your room look a lot smaller. If you have dark tiling, then ensure the rest of the room is as light as possible. Alternatively, choose a vertical stripe on the walls. As with fashion, vertical stripes lead the eye upwards and will give the illusion of a higher ceiling, but don’t go for thin stripes or busy patterns. If your small bathroom is lucky enough to have bathroom windows, try and place mirrors where they’ll catch the light. The light will then be reflected around the room and give the illusion that you have more windows than you actually do, and more space too. 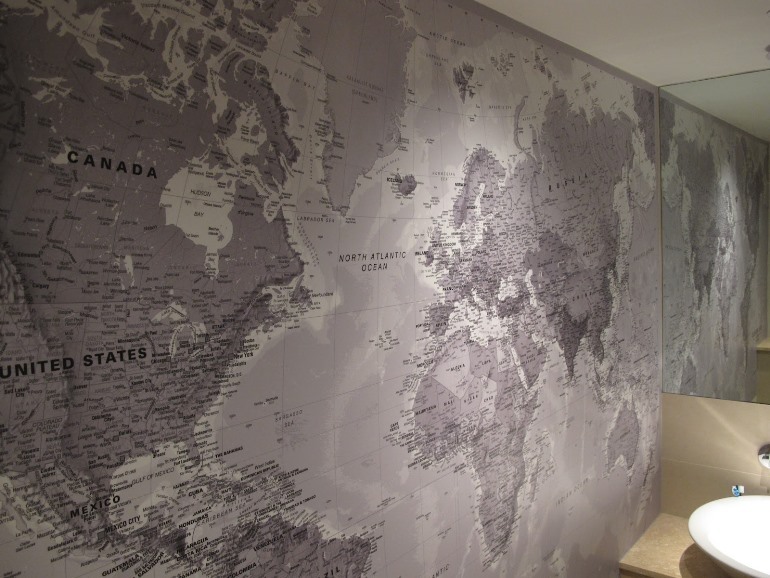 Murals are highly unique and original but aren’t often used in smaller bathrooms as they can sometimes be visually overpowering. A bright, light and coloured wall mural can make a small bathroom appear larger and add depth to a small and narrow room. When it comes to mirrors, you can afford to go supersize. Big mirrors will double the impact of the light and reflect it around the room. Natural light is also preferential but don’t worry too much as strategically placed sconces or backlighting will produce the same effect. If you have windows in your bathroom, ensure they are kept free of clutter and avoid heavy shutters, instead opting for a translucent window shade or frosted glass. Consider making the most of the space by adding an over-door shelf, a shelf unit (which takes up very little space) or hanging towel racks on the door. Be creative with your storage needs! If you’re a confident DIYer then recessed shelves in the shower/bath area are stunning and they make the most of unused space. A shower caddy is a handy and cheap alternative for the amateurs (like me!). Mirrored wall cabinets such as medicine cabinets will reflect the light whilst also hiding away your toiletries, freeing up floor space whilst open glass shelving will encourage you to keep clutter-free! So, by following a few of these simple steps you should have enough floor space (…to avoid any nasty toe-bashing) and by playing around with lights, mirrors and accessories you should be well on the way to loving your little bathroom. After all, they are cute, cosy and all yours. For more information on how to make any room appear bigger, be sure to check out our infographic. Have you got any tips we haven’t mentioned? We’d love to hear from you so be sure to drop a comment, Facebook us or Tweet us.